These boards come with all surface-mount components pre-soldered. The included header strip can be soldered on for convenient use on a breadboard or with 0.1" connectors. However, for applications subject to extreme accelerations, shock or vibration, locking connectors or direct soldering plus strain relief is advised. Cut the strip[ to length if necessary. It will be easier to solder if you insert it into a breadboard - long pins down. Place the breakout board over the pins. Connect the GND pin to GND on the Arduino. Connect the VIN pin to the 5v pin on the Arduino. For the best possible accuracy and precision, you can use the output of the accelerometer boards voltage regulator as the analog reference for the Arduino. Connect the 3Vo pin on the accelerometer board to the AREF pin on the Arduino. If you connect an external voltage reference to the AREF pin, you must set the analog reference to EXTERNAL before calling analogRead() (e.g. in your setup() function). Otherwise, you will short the internal reference with the external reference, possibly damaging your Arduino board. As with all sensors, there is some variation in output between samples of these accelerometers. For non-critical applications such as game controllers, or simple motion or tilt sensors, these variations are not important. But for applications requiring precise measurements, calibration to a reliable reference is a good idea. Acceleration is measured in units of gravitational force or "G", where 1G represents the gravitational pull at the surface of the earth. Despite what you may have heard, gravity is a pretty stable force and makes a convenient and reliable calibration reference if you happen to be a surface-dwelling earthling. For High-G accelerometers such as the ADXL377, the +/- 1G range of static calibration is too small to assure good accuracy over the +/- 200G range of the sensor. Accurate calibration for extreme G-forces requires more specialized equipment to repeatably create these extreme forces in a controlled environment. One commonly used technique is to drop the accelerometer from a known height and measure the negative acceleration at impact. To calibrate the sensor to the gravitational reference, you need to determine the sensor output for each axis when it is precisely aligned with the axis of gravitational pull. Laboratory quality calibration uses precision positioning jigs. The method described here is simple and gives surprisingly good results. First mount the sensor to a small breadboard like the one on the left. The back and squared edges of the breadboard make a reasonably accurate set of reference planes to orient the sensor for calibration. Wire the sensor as shown below. This is equivalent to the circuit shown on the previous page, with the addition of a switch. Load the sketch below onto the Arduino and run it. Press and hold the button until you see "Calibrate" in the serial monitor. This will calibrate the minimum value for the z axis. Repeat this for the three other edges to calibrate +x, -y and -x. Once calibrated, the output will show the calibrated raw range for each axis, followed by the measured "G" forces. The raw ranges can be used as constants in sketches. 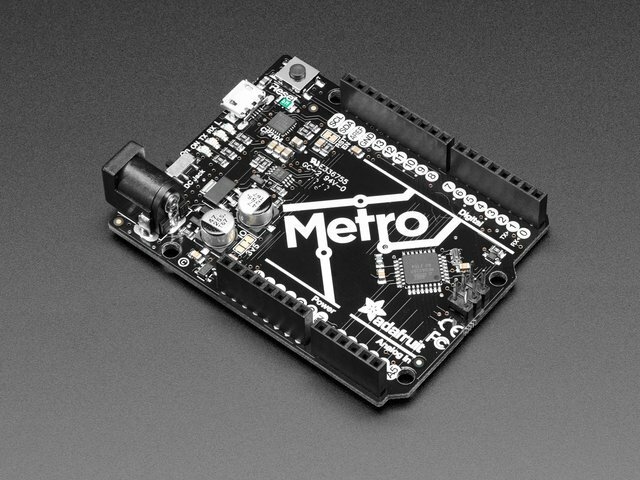 It's easy to use the analog accelerometer breakouts with CircuitPython and its built-in analog I/O module. You can read the X, Y, Z accelerometer axis values as simple analog inputs that are converted to acceleration values with simple Python code. 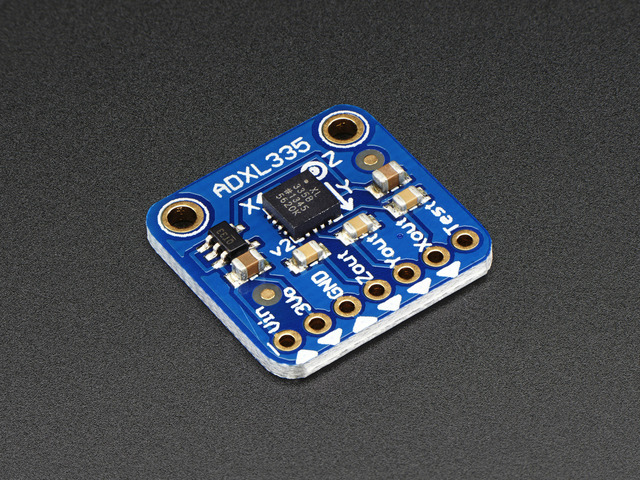 This page will show how to use the ADXL335 with a CircuitPython board like the Feather M0. Remember your CircuitPython board must support and have three analog inputs, so the ESP8266 and small boards like Gemma M0 won't work. Stick with a Feather or Metro M0. Remember you can use any available analog inputs for the X, Y, Z outputs. Be sure that these analog inputs are tolerant of up to 3.3 volt input (the Feather and Metro M0 powered by 3.3-5V as shown will be tolerant)! # Convert axis value to float within 0...1 range. # Shift values to true center (0.5). That's all there is to using the ADXL335 with CircuitPython! 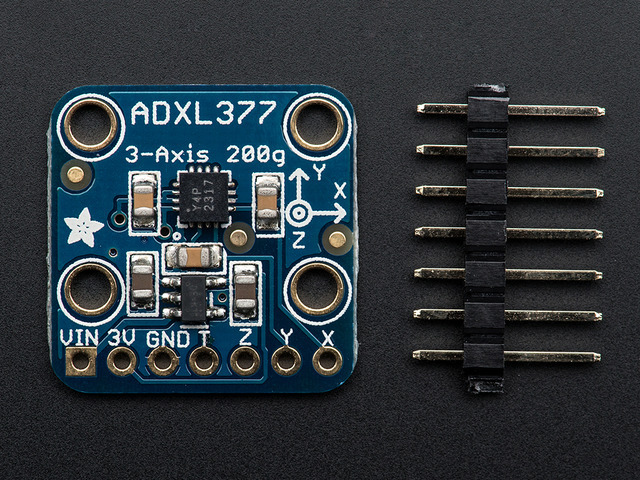 You can use the built-in analog input capabilities to convert the accelerometer's X, Y, Z axis acceleration into a gravity value for your own use! # Create analog inputs for each ADXL335 axis. # Define function to convert raw analog values to gravities. # Main loop prints acceleration every second. This guide was first published on Nov 05, 2012. It was last updated on Nov 05, 2012.